Seated in front: DB Janse van Rensburg (Paul Roos Gymnasium), Buhlebenkosi Mene (wheelchair recipient) and Damian Willemse (DHL Western Province Rugby). Standing back (fltr) Adri Spangenberg (Polystyrene Association), Zikhona Mene (mother), Paul Spangenberg (Paul Roos Gymnasium) and Celista Gerber (Tygerberg Association for Persons with Physical Disabilities). Buhlebenkosi was born with Spina Bifida – a birth defect that occurs when the vertebrae don’t form properly around part of the baby’s spinal cord. “She won’t ever be able to walk and I have to carry Buhle everywhere we need to go. She is growing and getting too heavy for me, but we don’t have the money to buy a wheelchair for her,” explained her mother, Zikhona Mene. Each year, close to 300 wheelchairs are handed over to recipients thanks to the collection of the breadtags which are made of high impact polystyrene (HIPS). These plastic closures have a high recycling value and the Polystyrene Association has established a network of buyers around the country who have agreed to pay R8.00 for each kilogram of bread tags. Once enough tags have been collected to cover the cost of the wheelchair selected, this money is then paid over to the pharmacy or wheelchair supplier of their choice. “DB Janse van Rensburg is a Grade 11 pupil at the Paul Roos Gymnasium in Stellenbosch and one of our most enthusiastic collectors,” explains Adri Spangenberg, Director of the Polystyrene Association and administrator of the Breadtags for Wheelchairs Project. 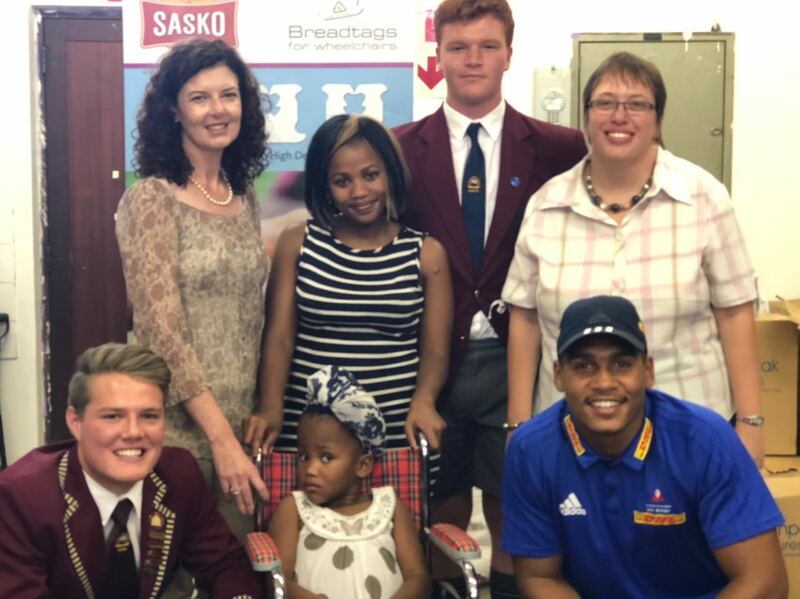 “He heard about Buhle’s plight and encouraged his fellow pupils, the local community and the Stormers rugby team to become involved through his friendship with Stormers flyhalf and ex-Paul Roos pupil, Damian Willemse,”she said. A temporary wheelchair was handed over to an excited Buhle at the Tygerberg Association for Persons with Physical Disabilities by Van Rensburg and Willemse. “Because it is important to ensure that the correct wheelchair is purchased when seating quadriplegics, the QuadPara Association of South Africa (QASA) assesses the requirements of each wheelchair recipients and ensures they get the right chair for their needs. In the interim, little Buhle will have been given the gift of mobility and a wheelchair with which she can get around,” Adri clarified. “We are very excited to be part of this project and to have been able to improve the life of this little girl. As part of National Disability Rights Awareness Month (3 November – 3 December), we want to encourage people to start collecting their breadtags. It is amazing to think that something so small and easy to do can have such a big impact on the lives of other people,” Willemse said during the handover. “Our sincere thanks goes to DB, the Stormers Rugby team and every volunteer who collects their breadtags. It is thanks efforts such as these and the support of large corporates such as SASKO and Zibo Containers that we have seen the project grow in leaps in bounds over the past 10 years. Today, we are proud to say that the Breadtags for Wheelchairs Project has not only diverted more than 5 tons of plastics from landfill in one year, but has grown into an international volunteer effort that has changed the lives of thousands of people. Polystyrene Association’s website or their Facebook page.